Sparkling with tiny treasures, these patterns are a treat for paper-piecing enthusiasts. 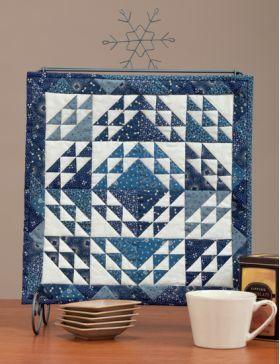 New to paper piecing? Learn the popular technique with a small investment of time and materials. Each 12" x 12" project can be quilted on your home machine, and a fat quarter is all you need for backing and binding. I have been bugging Connie for 2 years - waiting for this book to come out. I wasn't disappointed - They are the perfect "Little Gems" and I have completed one "Red Hots" in pink, and can't wait to start another one. I always loved small quilts and paper piecing. 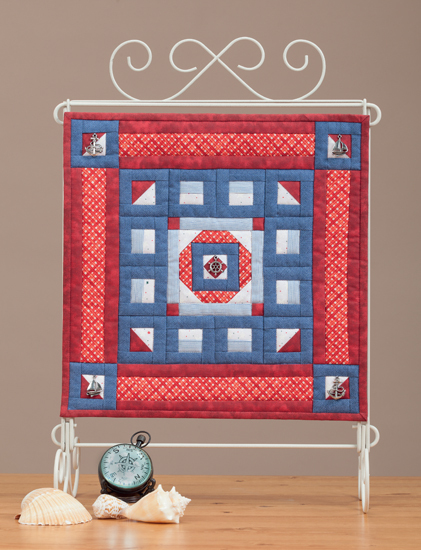 Was a subscriber to Miniature Quilts. Hated it when they stopped publishing. This speaks to me. I just finished one of the projects featured in Connie's book, called Serenity, and I love it! 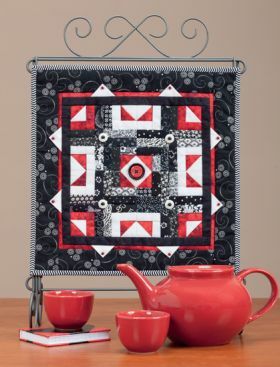 As Connie suggests in her book, I just picked fabrics at random as I was putting the blocks together. 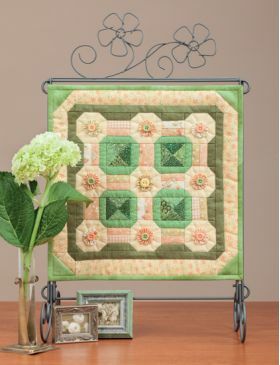 If you have never tried it, Connie gives you lots of details at the beginning of the book so, by the time you choose which of the 15 projects you want to make, you will feel very confident you can do it. I used the Foundation Papers by Martingale which made the whole process a breezy. I am already picking my next project from this book! 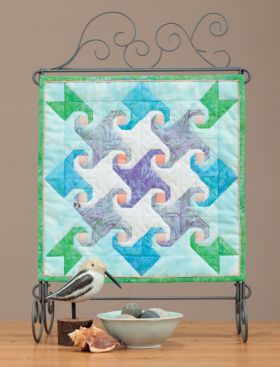 A must-have in your quilting library, particularly because she gives you ideas of how to enlarge patterns to make bigger quilts, too. 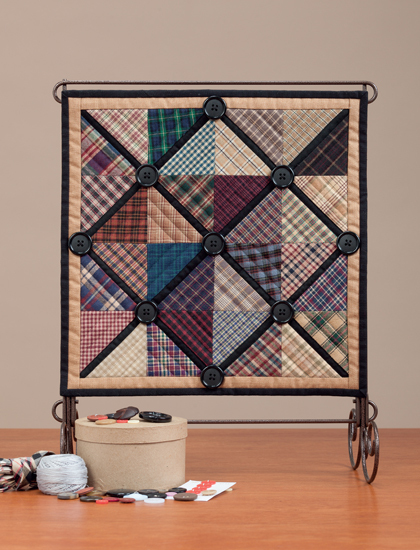 These are great looking miniature quilts. Great for embellishments! Good patterns to use up scraps. 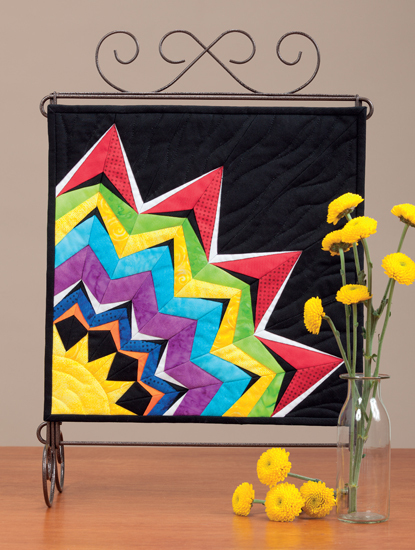 A definite must have book for your quilting library. What a neat book! 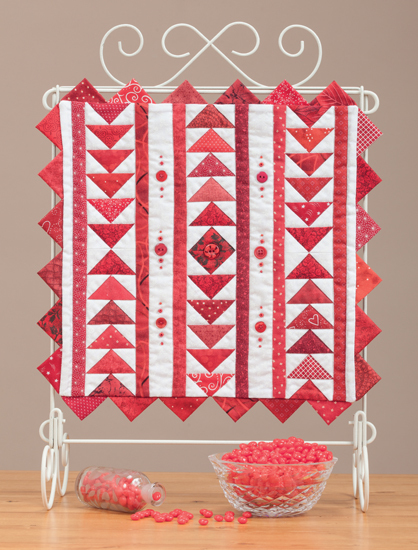 I love paper-piecing and Connie's patterns are very precise and easy to understand. I have fabric waiting for the "Playing with Plaids" quilt. 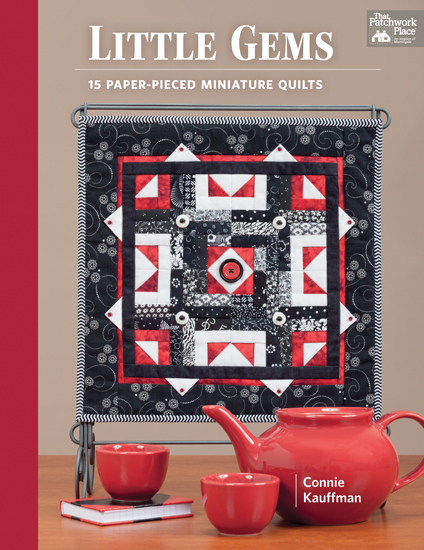 A definite "must have" book for those who love to quilt, especially paper-pieced! Easy to read and understand makes creating these miniatures such a joy. The step-by-step instructions makes it so simple. 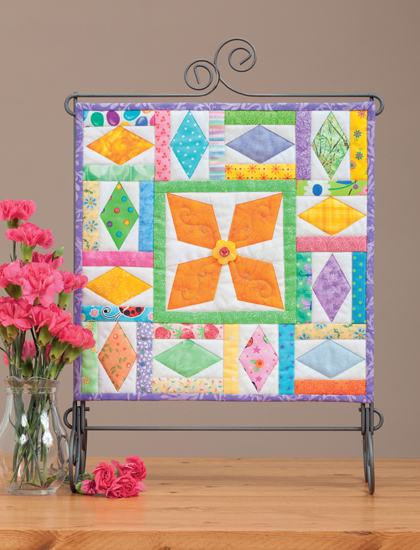 Even beginners will be able to quilt one of Connie Kauffman's lovely designs. There are 15 of her miniature gems in this book, wow! Can't wait to try to see how many of these I can create! Beautiful photos and drawings with clear instructions. I like the small arrows for pressing directions. The designs are varied--sure to find some that please. All the patterns in this book are so tempting that I can't decide which one to make first. I will probable start with the first one and work my way through to the end. Si Ustedes como yo guardan todos los retazos y sobrantes de telas para utilizar en algún proyecto más adelante, entonces permítanme decirles que este libro es para nosotras. 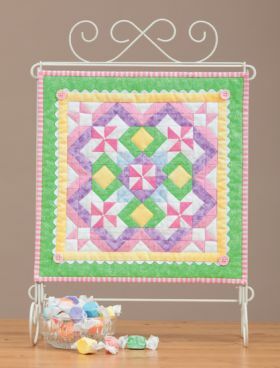 Las quilts a pequeña escala o mini quilts como también las conocemos son un deleite a la vista además de que se consideran pequeñas obras de arte. ¿Joyas de la Corona? En este caso son ¡Joyas de la Costura! Se cree que trabajar con piezas pequeñas presenta siempre un reto tanto en el corte como en la costura misma, lo que la autora de entrada ya nos facilita pues cada patrón se trabaja con la técnica del Paper Piecing. 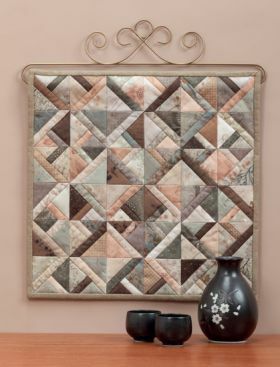 Por años enseñé la técnica de Paper Piecing y aunque al iniciar pareciera complicada, no lo es en lo absoluto. Yo les garantizo que al tercer retazo que coloquen sobre el papel, lo cosan por el revés y lo alisen al derecho, verán la lógica del proceso. Todas mis alumnas lo han confirmado. Me gusta mucho que la autora además nos brinda en los proyectos que se prestan para ello, la opción claramente explicada para aumentarlos de tamaño y poder hacer un camino de mesa o bien una frazada. Además de ofrecer 15 proyectos cada uno muy diferente del otro, el libro viene salpicado de tips y sugerencias en cuanto a colores, el estampado, y por supuesto técnicas adicionales para darle un hermoso terminado a cada mini quilt incluso con cuentas y abalorios. Ya sea formando parte de un conjunto decorativo sobre la pared, sobre una cómoda, una mesita de centro... que al momento en que voy escribiendo esta reseña, se me siguen ocurriendo tantos sitios dentro de la decoración de la casa donde se pueden exhibir estas pequeñas joyas de la costura. Ya no veo el momento de comenzar a coser! If you, like me, keep all the scraps and leftover fabric to use in any project later, then let me tell you that this book is for us. 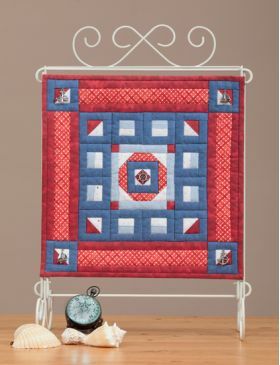 The quilts, small-scale or mini quilts as we know them, are a delight to the eye plus they are considered works of art. Crown Jewels? Here are Jewel Couture! Working in small scale offers many advantages to use scraps we already have at home; plus the largest piece of cloth does not exceed 1/8 yard (15 cms) and the fabric for the back does not measure more than 14" x 14" (35 x 35 cms). It is believed that working with small parts always presents a challenge for both cutting and sewing it, which the author provides for each pattern works with the technique of Paper Piecing. 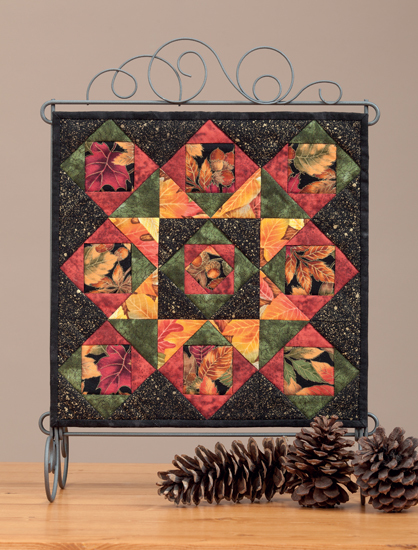 For years I taught the art of Paper Piecing and although the start seems complicated, it is not at all. I guarantee that by the third patch you put on paper, sewn and ironed, you will see the logic of the process. All my students have confirmed. 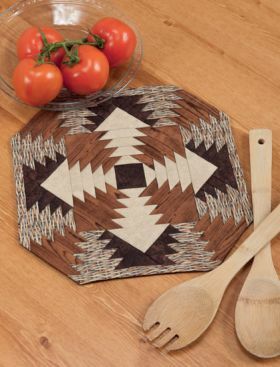 I really like that the author also gives us the projects that lend themselves to options, clearly explained, to increase them in size to make a table runner or a blanket. 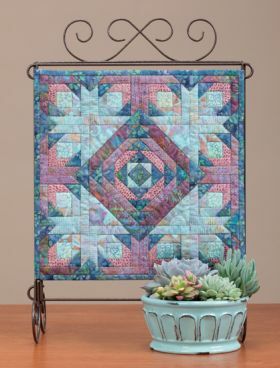 Besides offering 15 projects each very different from the other, the book is peppered with tips and suggestions for colors, printing, and additional technical tips to give a beautiful finish to each mini quilt, even with beads. Whether part of a decorative set on the wall above a dresser, coffee table ... at the time I write this review, I am still finding many places within the the house where you can exhibit these little gems of sewing. I can no longer wait to start sewing! Little Gems (aka miniatures) that can hang on frames, typically 12" x 12" are great ways to show off your quilting skills, decorate your home, and also make excellent gifts. 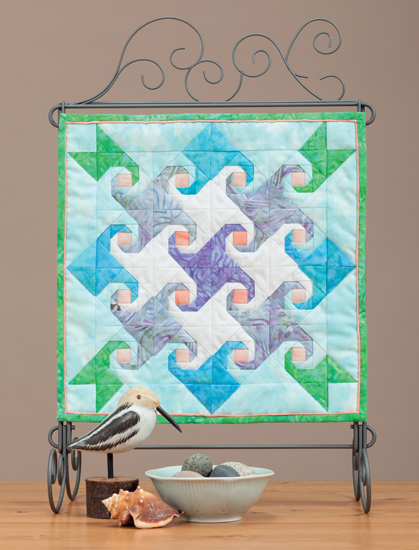 I'm very excited about a new book by Connie Kauffman, Little Gems: 15 Paper-Pieced Miniature Quilts. All of the patterns in this book come with easy to follow instructions with great visuals. There are also sections for Special Techniques for Mini Quilts that share information on Fabrics, Supplies, Paper Piecing, Quilting, and Hanging Sleeve(s), making this book an excellent book for quilters of all levels. And when you consider that this book has 15 patterns, [and] you compare the price of buying stand-alone patterns, this book is an exceptional value. I hope you get a chance to check out this inspirational new book at your local quilts shops, but if you don't see it, remember to let them know you are interested in having them carry it. 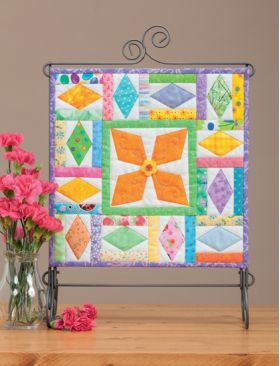 A love of color and fabric have led Connie Kauffman to an enjoyable career in quilt designing. 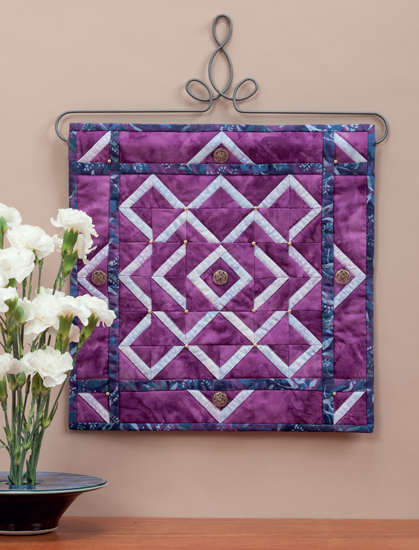 For many years, she has designed quilt patterns for books and magazines, and she enjoys trying out new ideas and designs. She is grateful to her mother, who taught her to sew and introduced her to the world of fabrics. Connie began her vocational career as a special-education teacher before focusing on raising her own two children. Her son and daughter now have their own homes and careers in teaching. Connie lives with her husband in Nappanee, Indiana, where she is also involved in numerous church and community activities. Visit her website to see more of her work.